I hope you love this round up, because these modern ways to decorate a pumpkin are definitely getting me into the fall spirit. I always pine for summer this time of year, but this dreary, rainy fall has made my longing for summer even stronger! I know I need to embrace the season (and steel myself for the winter that’s coming!) so I rounded up some ideas for how to decorate a modern pumpkin. I love quirky, weird, ghastly Halloween decor (exhibit A: my ghostly DIY rat wreath that grossed everyone out) but there’s something so much less jarring about a pumpkin that complements existing decor. Here are 15 of my favorite modern ways to decorate a pumpkin. You’re sure to love this list if you’ve been craving chic, elegant, and gorgeous fall decor. If you’ve got a link to a pumpkin decorating tutorial you love – or made – share it in the comments! All you need is a gold paint pen to create these beautiful botanical print painted pumpkins from Lovely Indeed. It’s the same technique I used to create my Pyrex-inspired pumpkin back in 2016 (an oldie but a goodie). Wood letters and a matte, monochromatic paint job make for a modern but quirky pumpkin with a message by Bliss Makes. Of course I’m going to sneak my own DIY pumpkin decorating into this list! I still love my easy marbled pumpkins – all it took was a bottle of nail polish and a bowl of water! These glass bead pumpkins from A Beautiful Mess are so clever because they create a gorgeous stained glass glow when a candle is placed inside! This mixed lot of glass dome beads has 200 pieces – that would make a lot of gleaming, glowing pumpkins for a walkway or patio. If you like the look of polka dots, but not the mess of drilling into a pumpkin, try my easy DIY sequin pumpkins, which was as easy as peel-and-stick. I picked up those sequins from the dollar store, but you can find muli-color sheets of these online too. How cute and quirky are these pastel pumpkin faces from The House That Lars Built? They totally crack me up and that’s exactly what us summer-lovers need in the fall! 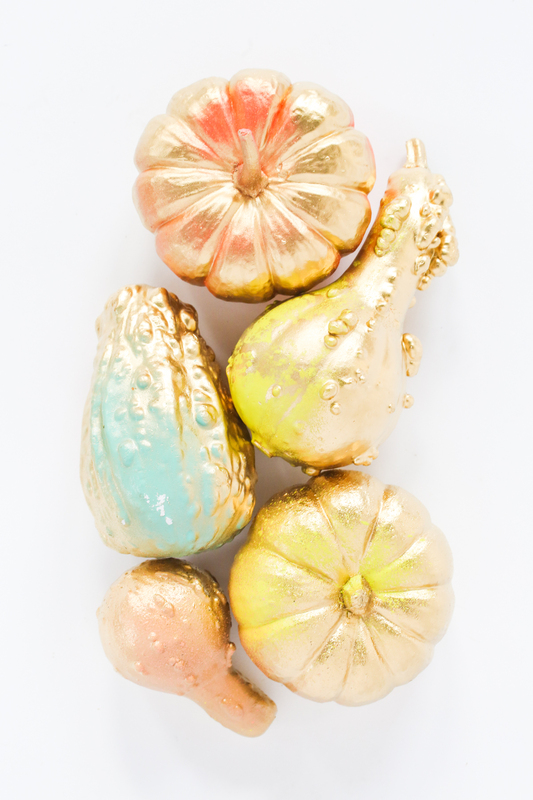 These metallic pattern painted pumpkins by Small Stuff Counts are really modern and so versatile. You can use a brush and gold craft paint or use the metallic paint pen for these too. A row of ombre blue painted pumpkins creates a modern coastal fall vignette on a fireplace mantle (this gorgeous look is from Making Home Base). Turn a painted pumpkin into a chic votive candle holder (via Homedit), perfect for a modern rustic tablescape. Recreate the look of those adorable heirloom jade pumpkins with this easy paint tutorial. I really, really want one of those real jade pumpkins so much, but thanks to Homey Oh My I can make my own. There you have it: my favorite 15 modern ways to decorate a pumpkin. Which idea do you like the most? Looking for more modern Halloween and fall decor ideas? My fall Pinterest board is brimming with ideas!